Just as I was packing up to leave camp and thinking people at the less populated campsites were friendlier, Pete popped over for a visit. In reality, I think people just try to respect each other’s privacy in such an enclosed space, but Pete was bold enough to say hello, and I’m glad. It’s nice to talk to people along the way. My VW pop-up top, Texas plates, and camping alone peaked his curiosity. He is an insurance agent located in St. Louis who specializes in small business health care. He and his buddies came down to fish with flies he ties as a hobby. He successfully hooked some trout with them…GO PETE! As we headed out of the park, I took picture of another mill. I don’t know the history behind it except it is a gristmill that was constructed in 1896. I was really just killing time while Petey was doing his business. His rambunctious personality, though now somewhat dampened by Addison’s Disease, disappears during bathroom breaks when he becomes the shyest dog around. He inspects the area and makes sure no one is looking before he circles in preparation. I pray for no noise. If a tree branch so much as bristles in the wind, he stops, and he starts the whole routine again in another location! The campground was too much for him. We had to move to quieter area! I should have spent some time geocaching here while I had the chance. It was the only park in Missouri where I had AT&T cell service and could get to the internet to look up cache locations. I have now left Missouri without a cache find, but I do return to the state toward the end of my road trip around the USA, so I still have the chance to find a cache in all 50 states. My first attempted stop of the day was the Indian Trail Conservation Area. I’ve learned National Forests and Conservation Areas aren’t always well marked, and this was no exception. It was basically a forest with gravel roads everywhere. Most intersections had a four foot wooden post with a number like 84751. Being new to exploring, that was greek to me! My goal was to hike along a portion of the Trail of Tears created in 1838 by the Cherokees on their forced march to Oklahoma. With only a guide post pointing to a fish hatchery marked with a warning sign, “KEEP OUT”, the likelihood of me finding that trail was so slim, I changed my plans. I just headed on to my next destination, Dillard Mill. 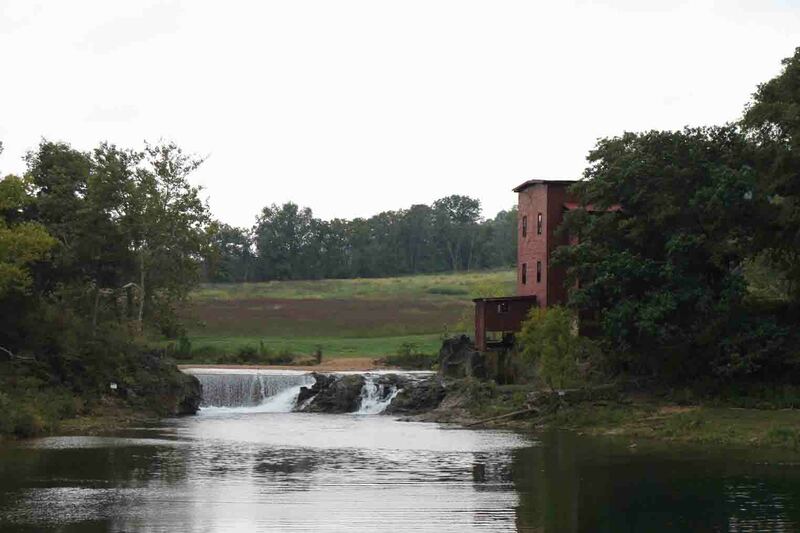 Reader’s Digest says Dillard Mill is a picturesque spot for a picnic. They are not mistaken. The mill sits on a hill overlooking hayfields and a pond that happened to be a resting place for a goose this morning. What they forgot to mention was that it is 11 miles on yes, another winding, dirt road. This book should be called Dirt Roads of America. I’m glad VANilla is hanging in there. She needs a few easy days soon. This mill was built in 1900 and also operated with an underwater turbine instead of a water wheel. On the quarter mile walk up to the mill, I found a geode. It was small and not fancy like the ones in the store, but it was still a geode, and I was pretty excited about my discovery. Close by the mill; however, the path was lined with giant ones. The attendant at the mill also suggested that I keep an eye for arrowheads…better luck next time. I met some motorcyclists here. One lady, Joanne, found a buckeye and gave it to me for good luck on my journey. What a nice gesture! Not far from the mill was a sign that said Gibb’s Farm. I was just recently in Tanzania where I stayed at a coffee plantation named Gibb’s Farm. I couldn’t help but wonder if it was the same family that owned such coffee plantation in Africa since they are an American couple from Missouri (I think). That’s certainly coincidental. Around lunch, I finally made it to a park with a mile long trail, Onondaga Cave State Park. It is actually known for its caverns like the one I saw in Arkansas a few days ago. While it was probably really cool, I opted to take the dogs for their mile long walk instead of the cave tour. It’s best if I wear them out in the morning, and it doesn’t take much in their old age and with their illnesses. Can you guess where we walked? To another spring. It lay next to the natural entrance of the cave which I wouldn’t have known without the park attendant telling me. I’ve found it’s worth stopping in the visitor’s center for a few minutes to find out the best parts of the parks from the rangers. The last park of the day before I started toward southern Illinois was Maramec Spring Park. I’m not sure it was worth the $5 admittance fee. Of course there was another spring, with a fish sanctuary, so this would be the place to visit for families with kids who want to feed the fish. Fish were everywhere, and some of them obviously hadn’t missed a meal. They were huge! I took the historic drive within the park, which turned out to be hilly, dirt roads again. I’m not sure why I was so shocked except that the rest of the park was so commercialized. I spotted some wild turkey, but they trotted to the brush before I could snap a photo. The park was once the site of a 19th century mining community, so the drive passed by a cemetery, the mine and locations where old houses used to stand. The first successful ironworks west of the Mississippi, established here in 1826, operated for nearly 50 years. All that remains is the furnace, an interesting sight. I had a long way to go to get from mid-Missouri to the southwestern tip of Illinois so I hit the road. I did stop off at Elephant Rocks State Park for about 5 minutes because it was on the way and the name sounded interesting. There were a bunch of giant rocks. It was pretty cool, but then again, if you can’t tell from my pictures and commentary, I kind of like rocks. So, I have generally been pulling into camp by 5 or at least have determined my destination, but today I wasn’t sure where I would land. From Elephant Rocks State Park to Cairo, Illinois, the map didn’t show much national forest or any state parks along the way. It did show two campgrounds, but they were private, and being the novice camper, I didn’t know what that entailed. Regardless, I didn’t even see them on the route, so as I crossed the river into Illinois around 6:30 I began wondering if I should press on or backtrack and stay in a Wal-Mart parking lot (I hear most the time they let you). Shortly after crossing the border, I found a private camping sign in Thebes. Thebes Landing Campground is right on the Mississippi River. It looked like it had 15 or so sites, and it was for temporary or long term guests. At first glance, I didn’t see anyone, and thought this will be safe. Then suddenly a barrage of rough looking men swarmed to my site. In the back of my mind I wondered if I should just hop back in VANilla and leave, but I timidly watched them move my picnic table and help me plug into the camper hookups. They pointed me to another camper where I would find the owner of the park. Soon I found myself eating a free fish dinner with these guys, some of whom looked like they could be on America’s Most Wanted. It was a perfect example of the phrase “Don’t judge a book by its cover.” as these the most generous and friendly folks I have yet to meet on my road trip around the USA. It turns out, they loved VANilla. They wanted to see the top pop up. Also apparently, within the 5 minutes of my arrival, they already had 2 bets on me (that I know of). One bet was my age…Missy, the only girl, won. The other was if just the front of VANilla’s roof popped up or if the back did too. Ray or Gino won (I’m not sure what his name was because they were messing with me). While I finished up my fried fish, cole slaw, fries, a tomato and a few banana peppers, I learned Neal owned a trucking line and retired. He bought this park from the town in March, and is doing some upgrades including docking an old barge on the river’s edge which he had to petition the government multiple times for the permit. He was so persistent despite all the rejections, that the government worker came to deliver the permit personally to meet him. I found out Missy works for the water department and Jonathan is an inventory specialist at RGIS. Both had extensive knowledge of the history around the area. Missy asked if we could exchange letters since she didn’t have a computer. I would have said yes, but I currently didn’t have an address! I met a handful of others, but didn’t get their story or picture. They all told me to visit the Thebes Historical Courthouse in the morning as Abraham Lincoln spoke there, so I will walk across the street to check it out before I hit the road. They also told me to go to Pink Rocks or officially name Castor River Shut-Ins – it’s in Missouri so maybe I can catch it on the way home. Wow, what a day! And what great dinner. Yum it looks good. I love all your photos! You know I like to go thru cemeteries (I know, that’s odd) and I found all the crosses to be quite beautiful in their simplicity. The fish are so cool. Showing my ignorance here — what kind are they? Last, but more importantly, how is Scout? Maybe she needs a day without a hike and some extra rest. I hope she is better today. Petey made a great pillow! I’m thinking you might should publish this when you finish your trip. It is so much fun to read and I feel as if I am there with you. I still don’t know what geocache is/are? Maybe Google will tell me. I’d love it if I could publish…definitely need an editor though!